The strong response to my recent radio program has led to a new confidential and anonymous FREE ONLINE SURVEY I have created about racial diversity on YOUR job. Please help me by completing this confidential survey. It will only take 8 minutes to complete. 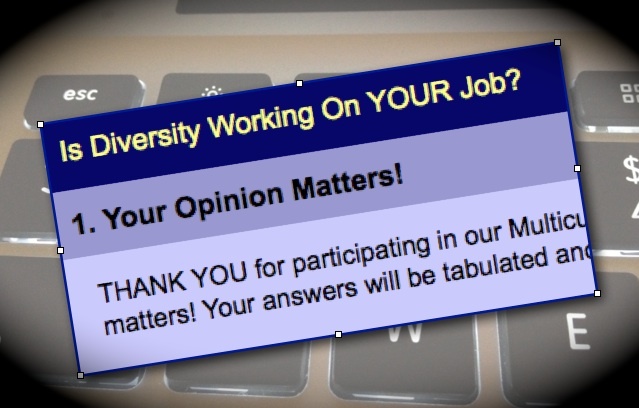 Since announcing the racial Diversity survey, I am getting some very strong responses and encourage YOU to complete it. Your identity will NOT be known!! It's completely anonymous. Honesty is encouraged. Thank you for your participation. Please forward this with your friends and colleagues.